The ANC, outraged at FNB's ‘Arab Spring' advertising campaign, accused the bank of committing treason. The ANC would have 'joe public' believe the "overwhelming majority" of young people are satisfied with the government's performance. Perhaps this is true in some regions, but in my experience, the youth of the nation (and I don't mean those 30 something old-timers in the ANC Youth League) is totally disillusioned with the state of the nation. Granted, my perception is based on opinions among urban youngsters of all races and genders. Cry of Treason Laughable or Dangerous? If the claim wasn't so dangerous it would be a laughing matter; but are we heading back to a nation where freedom of opinion is once again outlawed by the ruling political party? Back in the apartheid years, the ruling National Party considered any dissent treason, a fact that I, and many contemporaries, understood all too well. What about the actions of their own quasi-internal organisation, the ANC Youth League. 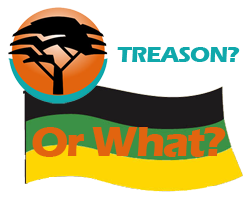 Are the recent events in Sasolburg and the Cape farmlands not acts of treason. 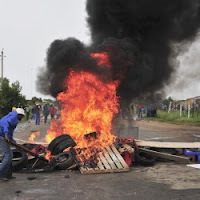 What about the unrest their members stirred up in Marikana. Wherever we see violent protest, civil disobedience and destruction of of property, the ANC Youth League seems close by. Is disrupting normal business activity, blockading roads, illegal protests (without having the easy to obtain permit), destruction of public infrastructure not treason, or at least economic sabotage? What is the dumping of urgently needed Schoolbooks if not treason, yet few state employees are yet to see the inside of a criminal court for their actions. For that matter, is it not treason to fail in providing learners with those same schoolbooks until the last month of the scholastic year? What was ousted ANCYL youth leader Julius Malema's inciting of unrest, lawlessness and racial hatred if it wasn't treason.